Palisades, New York (September 14, 2017) – Valorena Online, LLC is pleased to announce that an illustration from the forthcoming Cocoa Kids Collection Books© title has been selected along with works by a dozen other artists, to be featured in an upstate New York Art School show. In announcing its selection, RoCA acknowledged Valerie’s work for having captured the essence of the show’s theme. Her hand-drawn work, created to punctuate her books’ narratives, shows Lorena, the story’s protagonist, being body shamed by beach bullies until a trio of mermaids encourage her to love her body, while on vacation with her family. 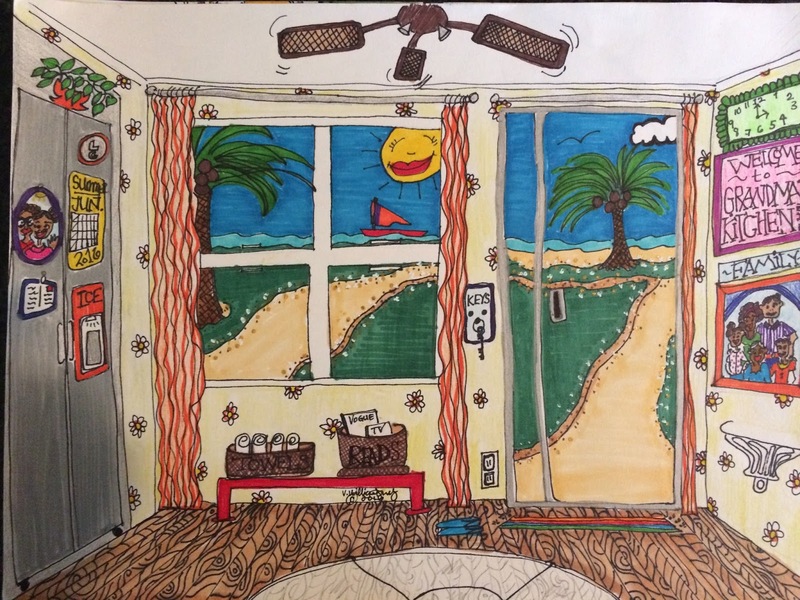 “To create this “Home” scene, I meditated on my own childhood and days spent at my grandmother Mary Evelyn (a.k.a. Evie) Givens’ house. Evie’s house was my home away from home, and time with Evie was always an adventure. Afternoons were spent in discussion of big ideas, learning and fun. It was Evie who encouraged me in my youth to “write something every day.” Scrabble was most always on the agenda at Evie’s, and day trips were frequent. An avid fan of the arts, Evie and I would travel by bus – Evie didn’t drive— to museums, galleries and gardens in my native Southern California, filling my childhood with vivid memories of love, laughter, and light. Even when no one was home, as was the case while she and I were out having adventures, Evie’s cluttered yet tidy home was a cherished space that I return to in my heart even now as an adult. Evie passed away in 2008. I called on these recollections of history to create an easy, breezy image that would evoke for my young readers the warmth of a summer day, and the love and comfort most often associated with home and family. These feelings are hinted at in the room’s details, like the family pictures on the walls and refrigerator. Also, I took a coloring book drawing approach to pull kids into the stories and to make the books more accessible, using a cheerful and bright palate, meant to appeal to young sensibilities’ developing visual literacy. I hope my books bring joy to my readers and inspire them to create and explore their own memories through reading and books. Artist Valerie Williams-Sanchez is the principal consultant for Valorena Online, LLC, a former daily journalist and writer who is the author of the Cocoa Kids Collection Books©, fictional tales that put multi-racial and minority children center stage in the self-published series that tackles big issues with wit, whimsy, and chocolate. 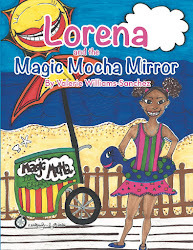 The third book of the series, Lorena and the Magic Mocha Mirror© marks Valerie’s debut as an illustrator. Valerie began illustrating her books out of a desire to perfect and fully articulate her creative vision. Markers were used for the book illustrations; however, Valerie’s preferred mediums are charcoal and watercolor. A certified Project Manager Professional (PMP®), Valerie is Mom to Lorena, 21, Auntie to Isaiah, 9, and a former teacher to countless, at-risk, and special needs kids of all ages. Valerie includes creative writing and drinking hot chocolate among her passions. 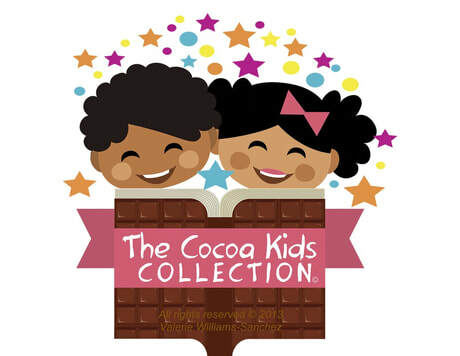 Learn more about Valerie and her books at www.CocoaKidsCollectionbooks.com.